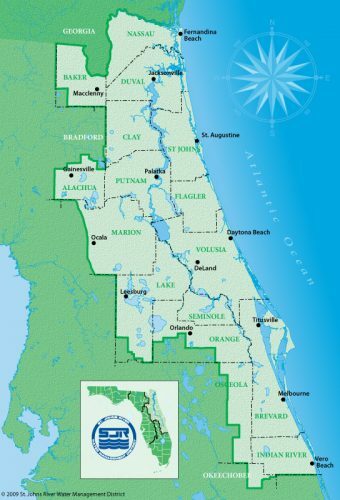 The St. Johns River Water Management District is an environmental regulatory agency of the state of Florida whose work is focused on ensuring a long-term supply of drinking water, and to protect and restore the health of water bodies in the district’s 18 counties in northeast and east-central Florida. While the district works closely with utilities on water supply issues, the district is not a water supplier. Florida’s five regional water management districts were established in 1972 by the state Legislature through passage of the Water Resources Act (Chapter 373, Florida Statutes). District officials recognize the need to have water resources available for people’s needs and to balance those needs with nature’s needs. In its daily operations, the district tries to strike a balance in water needs by educating the public about water conservation, setting rules for water use, conducting research, collecting data, restoring and protecting water above and below the ground, and preserving natural areas. The district covers 12,283 square miles, about 7.8 million acres. The main water body in the district is the northerly flowing St. Johns River, the longest river entirely in Florida (see maps page). The district’s staff includes biologists, geologists, hydrologists, engineers, planners, financial officers, information technology specialists, land managers, laboratory technicians and others from scientific and nonscientific fields. Many staff have advanced academic degrees and years of experience in their fields, both in the private and public sectors. In addition, many have been recognized for their work in the state, nationally and internationally. To protect our natural resources and support Florida’s growth by ensuring the sustainable use of Florida’s water for the benefit of the people of the District and the state. We care about the work we do and how we do it.